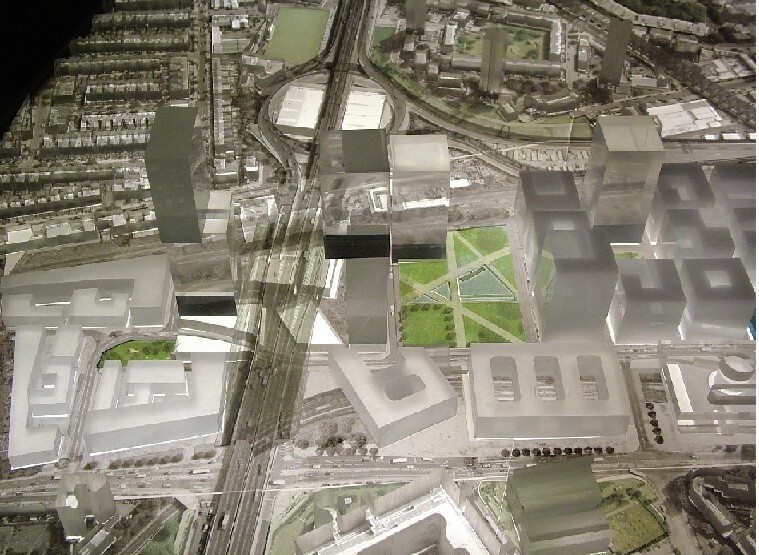 Below is a photo of the model prepared by Rem Koolhaas and OPA as part of their 2006 masterplan for the White City Opportunity Area. The very tall towers next to the Westway Roundabout are intended to suggest a ‘gateway’ to central London, for drivers entering the city along the elevated A40(M) motorway. The St Quintins Estate and Oxford Gardens Conservation Area are shown as dwarfed by these towers, in the top left hand corner. Ever since the days of Le Corbusier, planners and architects have been entranced by models of this sort, on which they can gaze down from above. Who other than motorists speeding along the motorway will be interested in the concept of a ‘gateway’ at this location? Yet this concept survived into the draft version of the 2011 White City Opportunity Area Planning Framework. This states ‘Towers of approximately 20-30 storeys (up to 100 metres) would be appropriate along the Westway at the gateway to central London. The architects have learned nothing since the 1960s! Another huge tower will increase the blight cast on the Victorian 2-3 storeys terraced houses of the St Quentins estate and Oxford Gardens Conservation Area by the adjacent motorways and massive elevated sections and roundabouts. Horrendous! Keep all the tall development to the south of the Westway: that’s just common sense.